Let’s get my introductory post to RennSport week started with something we haven’t had in some time; a Battle. 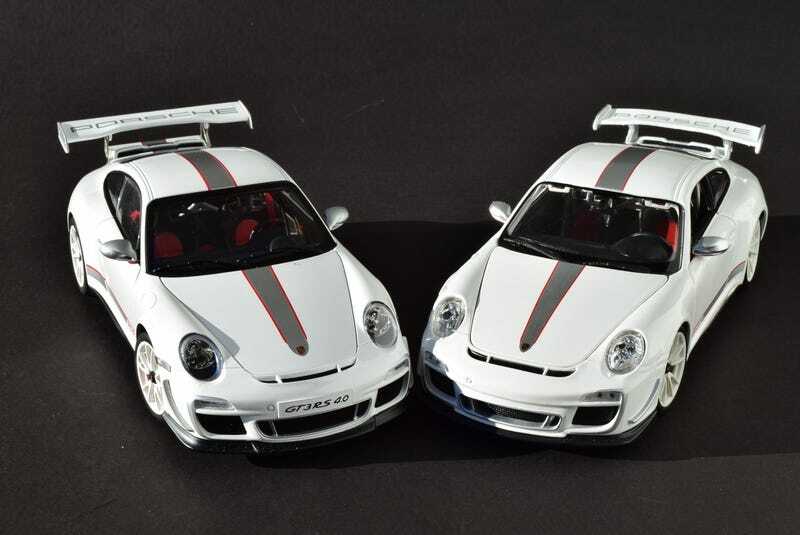 And for this battle, we have 2 997 911 GT3 RS 4.0s from Bburago and AUTOart. Longtime LaLD-ers will probably remember the 997 Carrera S battle I did with Maisto and AUTOart and wonder what’s the difference since Maisto has owned Bburago for over a decade now. Well despite that ownership, Bburago and Maisto don’t seem to share molds, so it will be interesting to see if the Bb can hold its own like its Maisto cousin did. Now before we get started, I just want to note that obviously the AUTOart is the better model. After all, even with the AUTOart’s currently discounted price of around $110, it is still over 3 times the cost of the Bburago (even more if you can get the Maisto-boxed Bburago from one of the wholesale clubs) The purpose of this battle is to highlight the differences between the models and see which one delivers the best value. That of course is a personal decision. When I compared the Maisto with the AUTOart, I saw that the Maisto delivered just about everything the AUTOart did, but basically lacked the refinement. How will the Bburago compare? First up in terms of the general shape of the car, both look good individually, but side-by-side, the Bb’s greenhouse looks a bit more squat than that of the Aa. I don’t notice this on other colors though, so it could just be a visual illusion of the white paint. The other area I’m drawn to on the Bb is the headlights. I can’t identify what it is, but they look off to my eyes. Bburago gets another demerit for the rather obvious mold line on the rear fenders that are conspicuous by their sheer size. Body openings on the AUTOart are a mix of open and closed mesh whereas on the Bburago, they are either closed mesh, or mostly just black paint. Wheels and brakes are done well on both cars, and the Bburago even has the tire air valve, but oddly, only on the front wheels. The paint on the Bburago’s wheels is on the thin side, giving the wheel a translucent appearance. Both cars feature rotating brake disks, with the AUTOart having an actual metal disk. Moving on to the rear, we find what I feel is the biggest flaw of the Bburago. The taillight does not have a reflector, nor was there any attempt to paint the body or inside of the lens silver, so you just see the white paint and lens mounting hole in the body through the transparent part of the lens. The spoiler on the Bburago is a single piece affair and black paint is used to represent the openings in the wing uprights, but only on the outer sides; the inside is just a solid slab of silver. On the AUTOart, the spoiler consists of 5 pieces with the uprights being made of stamped metal with actual openings. You also get scale inaccurate mounting screws. Underneath the engine cover, you find a bit more engine than you may be used to seeing on a 911 model. The Bburago’s seems to sit a bit low, but there is still decent-for-the-money detail there. But Bburago does score a little win here as they have properly modeled the carbon fiber air cleaner assembly/cover thingy. AUTOart seems to be using the slightly smaller and non-CF unit from the 3.8l engine. It makes sense as AUTOart also makes the standard GT3 RS where Bburago only made the 4.0 model, but that doesn’t excuse the inaccuracy. Open the doors and you find that the hinge type currently used by Maisto/Bburago doesn’t allow for much access. Get past that though and you find a decently molded and painted interior although the all chrome pedal set is a bit of a head scratcher. The AUTOart, like in that other comparo, doesn’t offer anything more than the Bburago, it’s just done to a higher standard. Overall both models mostly offer a level of quality equal to their cost, but the Bburago doesn’t punch over its price class like it’s Maisto cousin did. That, along with a questionable shape leads me to declare the AUTOart the winner of this comparison.